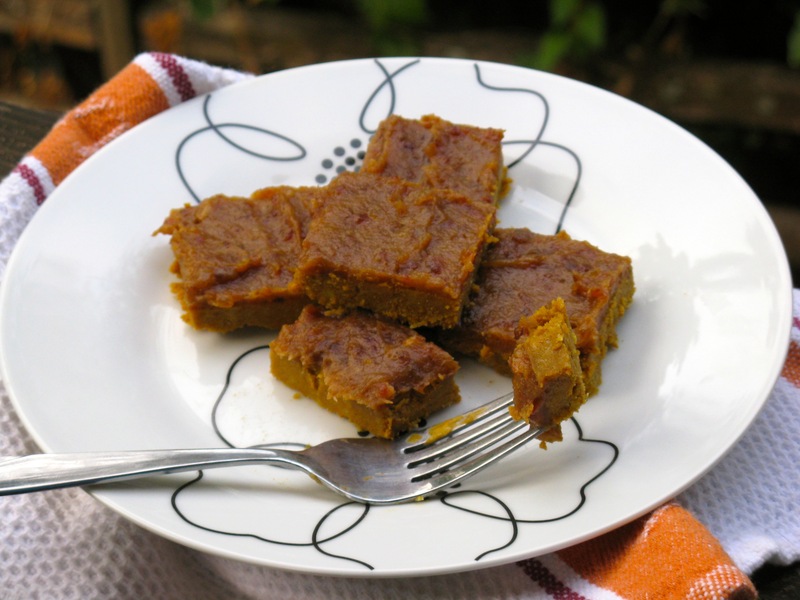 Pumpkin and winter squash are among my favorite fall foods! They taste great savory and sweet, and can be made a variety of ways. They are actually starches I can eat right now too, as I currently need to steer clear of any sort of yam, sweet potato or regular potato to continue healing. 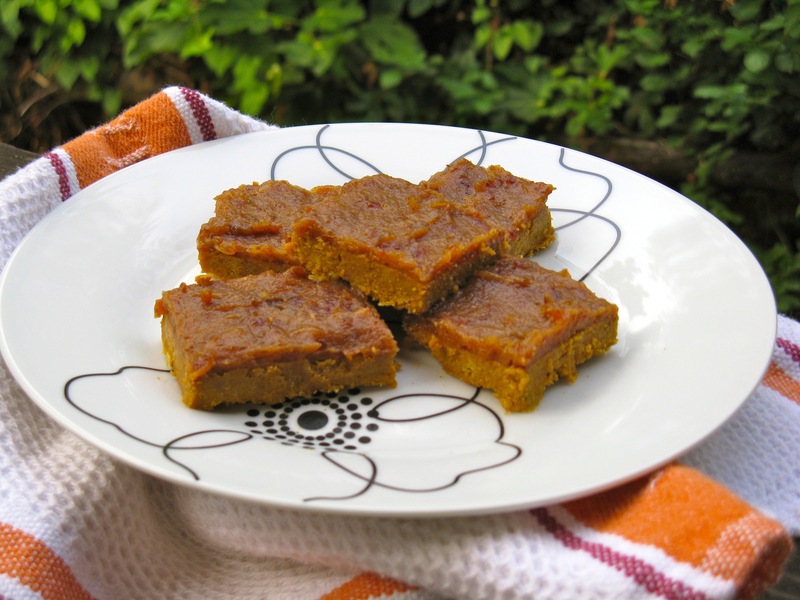 Meanwhile, I hope you enjoy these tasty fall-inspired pumpkin caramel bars. They are decadent! Let me know know what you think, especially about the date caramel! Update: watch this replay of me making these bars on KATU Afternoon Live in October 2016 here in Portland! Mix coconut oil, honey, pumpkin and spices together in a small saucepan on the stove over low heat. After several minutes, once the ingredients are mixed together well, remove from heat and mix in the sunflower seed or almond butter and vanilla. Stir until everything is combined. Pour into an 8×8 pan or an 8 or 9-inch round baking pan. Place in the freezer to set. Meanwhile, get going on the caramel. Add the softened dates to the food processor, along with the water, 4 Tbsp of the coconut milk, sea salt and vanilla. Pulse to combine. If mixture still seems a bit too thick or chunky, add the remaining 1 Tbsp of coconut milk and blend again. Please know, it’s not going to have the same texture as traditional caramel. Those look amazing! I will have to try the recipe! Thanks! It was an experiment that worked out quite well! Just watch out, they’re kind of addicting! The best food is always highly addicting! That’s why I always try to give extras away! Wow those look really good…I think my wife and I need to do some fall baking this weekend stat! I just had my first pumpkin spice latte this morning…fall is officially here for me! These look absolutely amazing! I cannot wait to try this. Yum! Thanks, Aly! 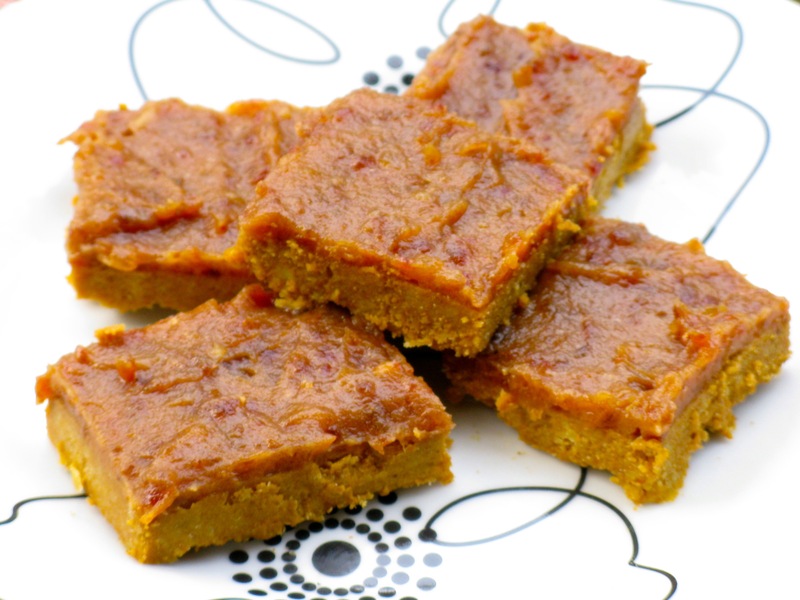 Yep, paleo or not, I think these will win many people over … as long as they like pumpkin! Yum! Just made pumpkin porridge this morning. Gotta love fall! Planning on trying these out this weekend for a pot luck I’m headed too, just wondering how many this recipe makes? Great! The quantity depends on the size you cut the bars, obviously, but it’ll yield about 16-24 bars. Hope they’re a hit! Nice, sounds like a tasty way to wrap up the 30-day challenge 😉 Watch out though, they’re addictive! I’m finding the date mixture watery …should it be? No, it shouldn’t be watery. It’s thick like caramel. How much liquid did you add? Always start with the lowest amount and add more if need be. Also, if you use dates that are already pitted, you may need a little less liquid. These dates tend to be smaller than those with pits. My recommendation would be to try pureeing more dates into the mixture. These look and sound amazing! I am very new to paleo, so I’m excited to try new recipes! Looking forward to seeing what you come up with! Thanks! I’ve been thinking of making these again soon, especially now that’s officially fall (as of today!) and pumpkin season. So glad you enjoyed them!